Belgium, 2015, 96 minutes, Colour. Kevin Janssens, Jeroen Perceval, Veerle Baetens. 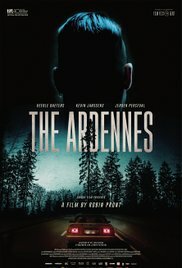 The Ardennes is a tough Belgian film, a film about of characters. Another film, made at this time, The First, The Last, has some similar serious characters in similar situations. This is the story of two brothers, involved in criminal activity, the younger getting away, the older going to prison for four years and then his coming out. One complication is that the younger brother has fallen in love with his older brother’s girlfriend and she is pregnant. She also works in a bar and a confrontation with the owner and the older brother killing him, relying on his brother to transport the body away and for an associate from prison to dismember the body and get rid of it. There are the confrontation elements, especially with the girlfriend who comes to a meal with the brothers and their mother. There is also the final confrontation between the two brothers, the older brother knowing the truth, and his violent madness coming out, with a shootout. 1. The title, the forest, the memories of the two brothers as children, mountains and hills, refuge? 2. A Belgian production, from Flemish Belgium, a tough story, tough characters, interactions? 3. The opening, the hijacking, going wrong, the brothers escaping, Dave and his not being caught, Kenny and the arrest? 4. Kenny, four years in prison, the effect, getting out, reuniting with his brother? Sylvie as his girlfriend, her not visiting him? His prospects? 5. The return home, the two brothers, the relationship, age differences, the relationship with their mother? The prospect of jobs? 6. Dave, his relationship with Sylvie, her being pregnant? Her work in the club? Kenny going to visit, the deception? The invitation to the meal at home? The mother wanting Dave to tell the truth? 7. Kenny, his temper, his killing the manager of the club? The difficulty in getting rid of the body? His contacting Steph? Steph and his associate? Dave being forced along, the driving? The Ardennes? 8. The buildup to the drama, the confrontation, Kenny and his knowing the truth? Dave, getting away? Steph, the cutting up of the body? 9. The buildup to the final confrontation, the shootout, the brothers face-to-face?